The Japanese government will take steps to exercise its right to so-called collective self-defense, allowing it to attack a third country when an ally is in some way under threat. The move is at odds with Japan' pacifist postwar constitution and has alarmed neighbors who recall the country's wartime aggression. Japanese Prime Minister Shinzo Abe is widely expected to amend the constitution so Japanese troops can once again operate overseas. Article 9 of the constitution says Japan forever renounces the use of force as a means of settling international disputes, unless the country comes under attack. At a press conference on Thursday, Abe said his government will take the necessary steps to amend the current interpretation of the article but stressed the move will not translate into Japanese troops participating in a third country's war for just the sake of using armed forces. Abe added Japan needs to exercise its right to collective self-defense in light of the North Korean missile threat and clashes with China over disputed islands. Opposition parties and civic groups protested, voicing fears that the move could put the country on a war footing again. Abe's assertion of Japan's right to collective self-defense is fueled by a desire to loosen the limits of the U.S.-drafted charter, which conservatives consider overly restrictive. He pledged not to let Japanese troops take part in multi-national combat operations, but the assurances were not enough to allay fears among Japan's regional neighbors of a fresh arms race in Northeast Asia. Abe has already started pushing for a Marine force and allowing exports of Japanese-made weapons, citing a growing threat from China. 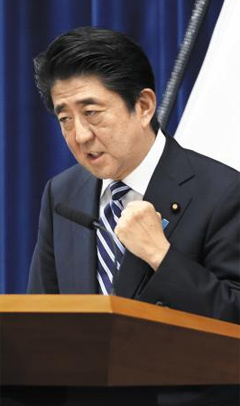 He plans to formally declare Japan's right to collective self-defense in June and wrap up any amendments to the constitution by the end of this year. Is Japan Eyeing Nuclear Armament?